Remember the iconic Saturday Night Live sketch about Shimmer, the dessert topping and floor wax? http://www.nbc.com/saturday-night-live/video/shimmer-floor-wax/n8625?snl=1 Believe it or not, Chevy Chase wasn’t that far off. Back in the 1950’s, a man named Aaron Lapin invented an aerosol valve that he attached to a can of whipped cream and invented Reddi Whip. He later started packaging other products including polyurethane foam through his company Touch and Foam. That company is now owned by DAP Products, America’s largest manufacturer of caulks and sealants. Spray foams are used as an easy to install insulation that offers an R-value of about 4-5 per inch. But in addition to air sealing, closed cell foams also prevent water leaks. High-Performance modular homes require great attention to insulating and air sealing. Mating walls, attics and sill plates are three places where air sealing and insulating must be perfect. Spray foams are the best solution for these applications. The industry refers to spray foam as either one-component (1K) or two-component (2K). You may not think so, but there’s a big difference between 1K and 2K technologies. One component (1K) foams are easy to use but aren’t well suited for large applications because as they cure, the small gas bubbles concentrate into large bubbles. The result is large gaps in the core of the foam, which can reduce the sealing qualities. This does not occur in smaller beads, but if you’re filling a large gap, it may affect the quality and the insulation R-value. 1K foams can be packaged three ways. The most common is the readily available straw grade can. It uses a plastic straw that attaches to the valve. Straw grade foams are somewhat messy to use because of the run-on of the pressurized foam between the valve and the end of the straw. They are also one-and-done, meaning that the polyurethane foam can cure in the valve and is impossible to use again. The next step up is to use Gun Grade 1K foam like DAP Touch N’Foam Professional All-Purpose Polyurethane Foam Sealant. This uses a separate foam gun. The gun’s valve is at the end of the nozzle. There is absolutely no run-on, zero waste and a much cleaner application. Here’s the challenge. Because many foam guns are poorly made you may have been disappointed because they also seem to be one-and-done. That’s not always the case. There are hundreds of different guns on the market and they don’t all perform the same. DAP has great confidence in the guns we sell. They can be left on a shelf for up to 30 days and will still perform. Here are a couple maintenance items to remember. Ok, just one maintenance item. Leaving the foam can attached to the gun assures that there is no opportunity for foam to cure inside the gun. DAP and all other foam manufacturers sell foam cleaners. Cleaners are pressurized solvents that are used to clean out the guts of the gun. To use a cleaner, remove the foam can, thread on a can of cleaner and spray it into a trash can. Soon, it will come out as clear spray. Let it sit for a couple minutes then repeat. You only need to do this once in a while to keep the insides of the gun clean. You can also use the spray tip to clean uncured foam sealant off the gun barrel and basket. Another thing you’ll find is that you get more value with gun grade foam. Turbulence in the straw may prevent the foam from fully forming and results in more density, limiting how much yield you get out of a can. For example, one straw grade foam sealant yields about 250 linear feet with a ½ inch bead. That same product, in a gun grade can will yield almost 700 linear feet. So, by switching to gun grade, even of a more expensive brand you will save time and money by getting more sealant out of each can and wasting less time changing cans out. You’ll have less trash and waste too. Your crew will also work faster and with more precision. IK foams are also available in large disposable cylinders similar to a propane bottle. 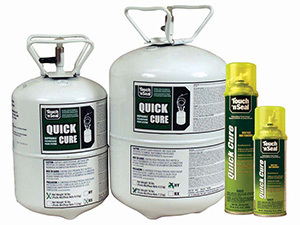 DAP Touch ‘N Seal Quick Cure comes in 10 lb and 16 lb cylinders complete with a hose and a wand. A 24 oz can of Quick Cure yields 1900 linear feet of a ¼ inch bead while a 16 lb cylinder will yield 24,000 linear feet. That’s 4 ½ miles of foam. 2K (two-component) foams are quite different. There is no risk of air pockets because the chemical reaction is part A mixing with part B. This gives a highly defined cell structure and no air pockets which makes for higher performance. The DAP foam system kits only require basic PPE. Safety glasses, latex or Nitrile gloves and a respirator when working indoors. A disposable painters suit will protect your clothing. Surface and air temperatures are critical with 2K foams. Cylinders should be stored above 70°F and the surface temperature must be above 60°F. 2K foams are measured in board feet of coverage. For instance, a DAP Touch N’ Seal Foam System 200 will cover a 12” wide board, 1” deep for 200 linear feet. In high-performance Modular construction, 2K kits are perfect for sealing mating walls and sill plates, both areas where air infiltration must be controlled to achieve excellent blower door and HERS ratings along with homeowner comfort. Another area where 2K foams excel is in attic insulation. A 1-2” layer of DAP foam between each truss joist performs three functions. It provides an unequalled air seal, a dense first layer of insulation and helps provide for an acoustic damper to keep the home interior quieter. Cellulose or fiberglass insulation above that completes the insulation package. This can also be done during manufacturing on walls in conjunction with blown in or batt insulation. DAP 2K foams kits range from 15 to 600 Board Foot sizes with even larger sizes available in refillable units. They meet all applicable codes and standards including flame and smoke ratings. As an insulator and an air seal, 1K and 2K foams are unparalleled in their performance with modular builders. DAP stands ready to assist you in your next project.